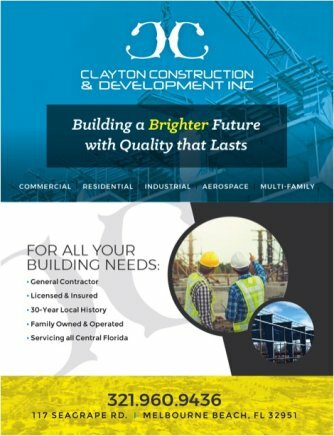 Home > Categories > Contractors > Clayton Construction & Development, Inc.
Clayton Construction & Development, Inc.
General Contractor specializing in commercial, industrial, residential, marine, and custom construction in Central Florida. At Clayton Construction, we are committed to making your building project a success! For over 30 years, we have delivered exceptional craftsmanship and reliable service throughout Central Florida. With the highest level of integrity and uncompromising quality, our project results will exceed your expectations. Family owned and operated, we take tremendous pride in our community and the services we provide. We understand that our work has a direct impact on the environment where our family, friends, and neighbors prosper. It is our goal to deliver a quality service in the most efficient manner. Clayton Construction is a licensed and insured for your protection. CALL 321.361.9667 or EMAIL TODAY! Clayton Construction will tailor construction services based on your needs and goals. We always remain quality-driven and customer-focused. Our extensive knowledge and diverse experience will bring you the results that you expect. We work closely with our commercial clients to maximize every construction dollar. Our attention to project detail will help eliminate waste and deliver what you need when you need it. We build multi-family homes, apartments, condos, hotels, and timeshares! Building or remodeling a client’s home is something that we do not take lightly. This is a very personal and emotional project for most of our clients. Trust in us and we will bring your vision to life. We build custom homes! Our experience building in the Florida climate and along the waterways will ensure your marine construction project is done correctly. We understand the harsh conditions that Florida endures and the unique skills that can overcome it. We build tomorrow’s commercial construction projects! Having experience with industrial and aerospace customers, we understand the complex issues that may arise while building an industrial or aerospace construction project. We remove obstacles and move forward to fill our client’s needs.